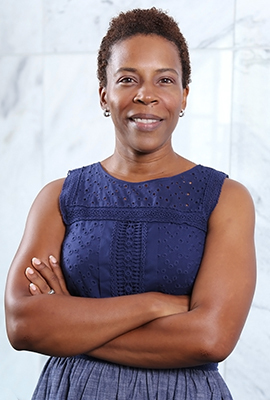 Andrea L. Dennis joined the University of Georgia School of Law faculty in 2010, was promoted to full professor in 2017 and was appointed to the John Byrd Martin Chair of Law in 2019. She came to UGA from the University of Kentucky College of Law, where she taught courses in criminal law and procedure, children and the law, and family law. Dennis received the University of Kentucky Alumni Association Great Teacher Award in 2010. Nominations for the award are submitted by students, and candidates must have superior knowledge of their subject matter, employ original and innovative classroom presentations, and demonstrate concern for students both inside and outside of the classroom. Dennis has also taught legal analysis and writing and research at the University of Maryland School of Law. Previously, Dennis served as an assistant federal public defender in the District of Maryland. She also worked for the Office of the Corporation Counsel prosecuting child abuse and neglect cases on behalf of the District of Columbia. At Covington & Burling in Washington, D.C., Dennis practiced corporate and patent litigation and antitrust law as an associate. She has also served as a judicial clerk for Judge Raymond A. Jackson of the U.S. District Court for the Eastern District of Virginia. In addition to her legal experience, Dennis was a senior associate in the National Office of Job Corps for the U.S. Department of Labor, where she engaged in strategic analysis and planning for national vocational training programs for at-risk youth. Her scholarship explores criminal defense lawyering, race and criminal justice, criminal informants and cooperators, youth advocacy, legal socialization of youth and the cradle-to-prison pipeline. She has published works in the American Criminal Law Review, the Catholic University Law Review, the Columbia Journal of Law and the Arts, the Howard Law Journal, the Marquette Law Review, the Nebraska Law Review, the Nevada Law Journal and the Journal of Legal Education. State courts nationwide have cited her research on rap lyrics as criminal evidence, and she has been quoted in The New York Times and the Los Angeles Times about pending cases concerning the issue. Dennis earned her B.S. in engineering with a psychology concentration from the University of Maryland and her J.D. from New York University, where she served on the Annual Survey of American Law. Decriminalizing Childhood, 45 Fordham Urb. L.J. 1 (2017). Criminal Law as Family Law, 33 Ga. St. U. L. Rev. 285 (2017). Black Contemporary Social Movements, Resource Mobilization, and Black Musical Activism, 79 Law & Contemp. Probs. 29 (2016). Talk Don’t Touch? Considerations for Children’s Attorneys on the Physical Touch of Clients, 65 Cath. U. L. Rev. 253 (2015). Good Cop-Bad Cop: Police Violence and the Child’s Mind, 58 How. L.J. 811 (2015). Encouraging Victims: Responding to a Recent Study of Battered Women Who Commit Crimes, 15 Nev. L. J. 1 (2014) (with Carol E. Jordan). Teaching “The Wire”: Crime, Evidence, and Kids, 64 J. Legal Educ. 111 (2014). A Snitch in Time: An Historical Sketch of Black Informing During Slavery, 97 Marq. L. Rev. 279 (2013). Prosecutorial Discretion and the Neglect of Juvenile Shielding Statutes, 90 Neb. L. Rev. 341 (2011). Collateral Damage? Juvenile Snitches in America's Wars on Drugs, Crime, and Gangs, 46 Am. Crim. L. Rev. 1145 (2009); reprinted in Adam M. Gershowitz, The Wire: Crime, Law, and Policy 372 (Carolina Acad. Press 2013). Note, Because I am Black, Because I am Woman: Remedying the Sexual Harassment Experience of Black Women, 1996 N.Y.U. Ann. Surv. Am. L. 555.